The blue color is taken from a UN logo at its website at www.un.org - Pantone (PMS 279). The flag is given as 2:3 or 3:5 or the same ratio as the national flag of the country. A light blue flag with the white emblem in the middle. The emblem consists of a circular map of the earth in azimuthal equidistant projection centered at the North Pole between two olive branches. UN: In the center of a light blue field there is the white badge of the UN - a simplified map of the world between the North Pole and 60 degrees south with all the inhabited continents shown in outline. The map is flanked by two olive branches... Blue and white are the colors of the UN, the olive branches symbolize world peace, and the map of the world shows the extent of the UN's sphere of influence. The map projection used is Azimuthal Equidistant, centred at the North Pole. As a consequence the parallels shown (which correspond to latitudes of 60 and 30 degrees South, Equator, and 30 and 60 degrees North) are concentric circles and the ratio of their radii is simply 5:4:3:2:1. Also shown are eight meridians (corresponding to the longitudes divisible by 45 degrees); the international 0 and 180 degrees meridians are shown vertically. I believe that this map projection was chosen because in contrast to traditional world maps, no particular nation is emphasized. (c) The same proportions as those of the national flag of any country in which the United Nations Flag is flown. (2) The emblem shall in all cases be one half of the hoist of the United Nations flag and entirely centered. Quoted from the US Navy's "Flags, Pennants, and Customs," NTP 13(B), which for some reason best known to its compilers quotes the UN Flag Code in its entirety, despite the fact that by US regulations the UN flag can be flown aboard US Navy ships and US military installations only to honor a senior UN official paying a visit (as one would fly a foreign flag for a foreign head of state). A/106 (1946) is a report of the Secretary General to the General Assembly, dated 15 October 1946. It is a discussion of the need for a symbol, and says "The present symbol which now appears on the Charter of the United Nations, as well as on badges, passes, letterheads, etc., of the United Nations is a modification of the design created by members of the Presentation Branch of the United States Office of Strategic Services in April 1945, in response to a request for a button design for the San Francisco Conference. This design may be described as follows." There follows the description of the map, including the colors, "in gold on a field of smoke-blue with all water areas in white." The Secretary General goes on, however: "In connection with the adoption of an official seal and emblem for the United Nations, however, it is important to emphasize the fact that the United Nations is not committed to the use of this or any other particular design." A/204 (1946) is the Sixth Committee's report to the General Assembly on the seal and emblem, dated 2 December 1946. It recommends that the Assembly adopt the design with the colors specified in the same terms as the device previously used. (The main difference is that the map was expanded to cover the entire world, insofar as that is possible with a polar projection.) However, the actual resolution proposed for adoption by the Assembly does not stipulate the colors, but only "the design reproduced below." "Mr. Bailey (Australia), Rapporteur: On behalf of the Sixth Committee I read the following resolution: "The General Assembly, "1. Recognizes that it is desirable to approve a distinctive emblem of the United Nations and to authorize its use for the official seal of the Organization; "Resolves therefore that the design reproduced below shall be the emblem and distinctive sign of the United Nations and shall be used for the official seal of the Organization." "The design reproduced below" was a black and white drawing with no indication of colors on it. The printed text of the resolution as adopted is reproduced at http://daccessdds.un.org/doc/RESOLUTION/GEN/NR0/033/43/IMG/NR003343.pdf. The Pantone number for the official flag of the United Nations is reportedly Pantone 279C. I have found an official UN source that reports that the color is indeed Pantone 279. The UN source is at http://www.un.org/depts/dhl/maplib/flag.html. I think we must conclude that, whatever the intention of the design committee, the General Assembly did not specify any colors for the UN emblem, and that smoke-blue is therefore of historic interest only as the color of the original, unofficial emblem provided by the OSS. The description on the emblem at http://www.un.org/depts/dhl/maplib/flag.html is therefore misleading, drawing as it does from documents that were never approved by the General Assembly. In any case, none of the documents on the UN flag refer to smoke blue, only to "light blue." From what I remember, the light blue background was chosen as an internationally neutral color - the color of the sky as seen from every nation on Earth. The Flag Code of the United Nations, in pdf format can be found at http://www.un.org/depts/dhl/maplib/docs/stsgb132.pdf. It provides primary source material for a number of details. Its reference is ST/SGB/132 and is dated 01 January 1967. 92(I), 07 December 1946 Adoption of UN emblem. 167(II), 20 October 1947 Adoption of UN flag, bearing the aforementioned emblem. 19 December 1947 Issue of Flag Code, by Secretary-General, under the authority of the above referenced resolution. 11 November 1952 Flag Code amended by the Secretary-General. 01 January 1967 Regulations issued by the Secretary-General, which replace those Regulations of 11 November 1952, but not the Flag Code itself, which remains as amended on that date. The Flag Code covers such matters as Design of flag (Article 1), Dignity of flag (2), Flag protocol (3), Use of the flag by the UN and its agencies (4), Use of flag generally (Use of flag in military operations (Article 8), Manufacture and sale of flag (Article 9), Violation (Article 10), Regulations (Article 11). The provisions of the Regulations are similar: Dimensions of flag (I), Flag protocol (II), Use of flag generally (III), Prohibitions (IV), Mourning (V), Manufacture (VI) Alphabetical order (VII), followed by a Schedule of member nations at that date, in the English alphabetical order and a note stating that the laws of a member state should prevail in respect of any conflict which might exist. The UN's organisation chart can be found here: http://www.un.org/aboutun/chart.html. This chart also contains a link to each organisation's web site, so as to aid those who might be interested in investigating the meaning of the many acronyms used by the UN. As of 28 June 2006, following the addition of Montenegro, 192 independent nations were members of the United Nations. See the page on Dependent States for other "countries" that are of course not members of the UN. "UN aircrafts are normally painted white overall and carry the large black lettering 'UNITED NATIONS' or 'UN', and the [UN] flag as a fin flash. [...] There has been some use of the UN emblem as a wing roundel, and recently an increasing use of the national flag of the donor country, usually marked on a fin, smaller then that of the UN." It also says that the first use of the UN forces was in Israeli war of 1948, though it does not really suggests that the roundels were used already. Here is a picture for reference. 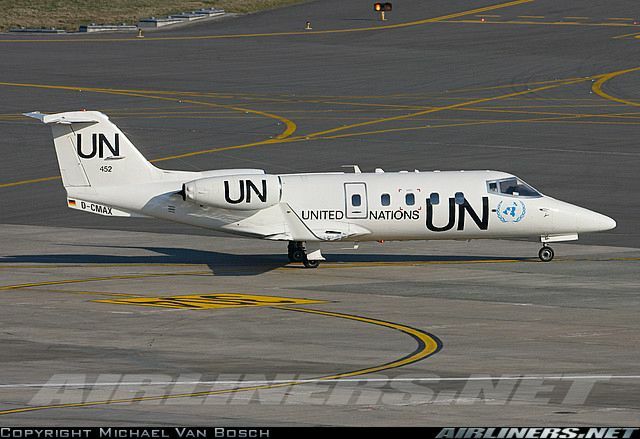 The depicted LearJet-55 is tasked for 'fast liaison- and Medivac-/Casevac-missions' on behalf of the UN. That is what is written in the contract, at least; mostly VIP in reality. I wasn't in the company when we started contracting for the UN, but I know that this paint- and marking-scheme was used right from the beginning. It is not according to the UN-rules, however: only 'UN', 'United Nations", the registration (here "D-CMAX") and the UN-call sign (here "452", hence "UN452") are to be shown. The crest was my company's idea (having NOT read the regulations, I was told...). Anyway, none of the UN-big-wigs ever really complained about it (actually: they love it). Our Lears (there are presently 5 of them) all carry the crest, and, to my information, they are the only aircraft to be 'allowed' that. The German flag on the lower fin has to be flown according to German law; normally: no flag. There's an interesting article at http://www.unausa.org/site/apps/s/content.asp?c=fvKRI8MPJpF&b=369041&ct=4212781 about Donal McLaughlin, the designer of the original version of the UN emblem that is also the basis for the flag. According to the article, the design was originally for a lapel pin to be worn by attendees at the San Francisco Conference in 1945. Mr. McLaughlin recently celebrated his 100th birthday. In DTV-Lexikon politischer Symbole, 1970, by Arnold Rabbow there is a lengthy expose' about the UNO-flag. In a white drawing on a light blue field the globe appeared on the flag, which was adopted 20 October 1947 by the plenary session of the UNO. Prior to the adoption of the present United Nations (UN) flag in 1947, the Secretary-General prepared a memorandum for that meeting, which reveals the existence of an unofficial historical UN flag. The Secretary-General cited the example of the then Commission of Investigation concerning Greek Frontier Incidents who had a flag designed for them by the UN Secretariat, in order that they "might enjoy the protection of and be identified by a neutral symbol while travelling through troubled areas or sitting at meetings under the jurisdiction of several countries..." as well as for the purposes of flying on UN headquarters, offices and other property. "This flag was composed of the official emblem of the United Nations, as approved by the General Assembly resolution 92 (I) of 7 December 1946, embroidered or printed in white on a background of light blue and encircled by the words "United Nations: Nations Unies". Its dimensions were: small flag - 12 inches x 18 inches; and large size - 4 feet x 6 feet, with the above-mentioned emblem of 5-1/4 inches in height and 5-3/4 inches in width and 22-1/2 inches x 24 inches, respectively, at the centre." His report goes on to state that the Secretary-General had in fact received over one hundred suggestions and designs for a UN flag from "several countries", all of which were available to national delegations for inspection. However, he felt that the design already used, without the encircling words, "possesses the essential requirements of simplicity and dignity to a greater extent than any other design which has been submitted." The General Assembly of the United Nations later went on to adopt his recommendation in Resolution 167(II), of 20 October 1947. The image above is based on the existing image by Željko Heimer, in turn based on images drawn by Graham Bartram, is a reconstruction following the description in Source (1), below, using a typeface similar to that on A/342 and other documents of the period. It has not yet proved possible to locate other documentary, in particular photographic, evidence of this flag, although I should be happy to modify this image accordingly when this turns up. The UN is not a country, it is merely an international organisation. Only country flags can be flown as ensigns and used as nationality markings. Perhaps the UN flag could be used as a jack on a ship in UN service, but it is more likely it would be used at a yardarm or so, as a sign for the ship's current mission. Further to the discussion about the use of the UN flag at sea, while searching for material on "transitional authority" I came across this picture captioned "A United Nations patrol boat with a naval observer plies the Tonle Sap River in Phnom Penh (UN Photo# 197299C)" on the website of the UN Transitional Authority in Cambodia (UNTAC). 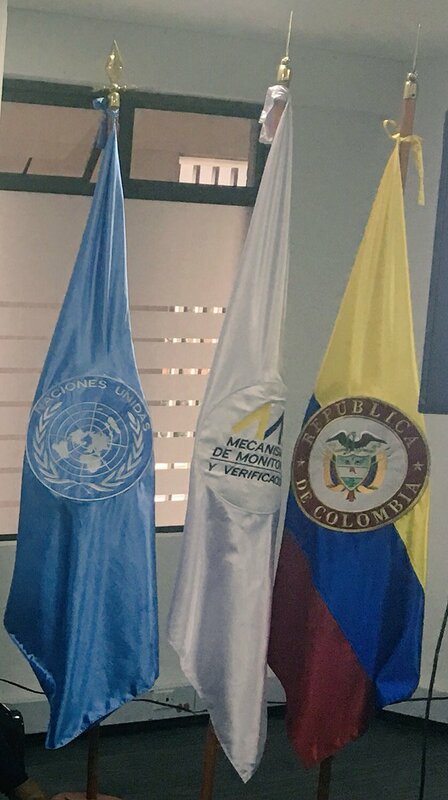 Here is an example of a UN flag, showing the name "Naciones Unidas" (Spanish) above the logo, as seen here (second flag from left to right): https://pbs.twimg.com/media/DC2rVsxXkAI6F8p.jpg (source: https://twitter.com/MMVCol/status/877545906517749760), published by @MMVCol on June 21, 2017, the official Twitter account of the MM&V (Mecanismo de Monitoreo & Verificación, English: Monitoring and Verification Mechanism), a tripartite coordination committee for the disarmament of the Farc. "Nations are assigned a flag pole, in English alphabetical order, north to south." According to http://www.un.org/Overview/Tours/UNHQ/, "Along First Avenue one can see the colourful display of flags of the Member States. Placed in English alphabetical order, the first flag at the level of 48th Street is Afghanistan, and the last one, by 42nd Street, is Zimbabwe." It has been noted that new flags are added to the display among the "R"s. The UN Headquarters campus, as it's called, is long- it runs from 48th to 42nd Street, and may soon extend one more block to the south- and narrow- it goes from First Avenue to the East River. The buildings, however, are all at the southern end, only starting at 45th Street, and concentrated even further south. The main visitors' gate is around 45th, and the main official gate (for cars) even further south. Now, the flags start at the northern end, and run almost to the southern end. Many (in the north) don't even have UN buildings behind them, and those at the very southern end are almost lost among trees and walls. So if you want a flag to be photographed at a nice spot, with a clear view of the flag, a nice backdrop of UN buildings, and convenient to building entrances where you can have a ceremony, you go to- you guessed it- the "R"s.
While in New York I went by The UN building a few times. 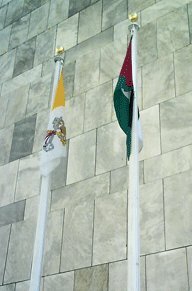 I am enclosing a picture of the flags of the Vatican (Città del Vaticano) and Palestine, which were flown every time I went by. They are by themselves quite a few feet away from the rest of the flags after the Z's (Zambia, Zimbabwe). perhaps this was not a temporary arrangement. When Switzerland joined the UNO in 2002 an agreement was reached that the flag would indeed be square. Only the Swiss and Nepali flags are not "UN standard" dimensions. From direct observation, I'm 99% sure (there was only an intermittent wind and tress in the way) that the Swiss flag is rectangular, 2:3, same as all the others, except Nepal. Nepal is not rectangular, of course, but the points are extremely long. If I had to guess, I'd say that Nepal is, overall, 2:3 (or more). See also http://www.un.org/MoreInfo/pubsvs.html for the gift shop with their famous flag poster (check 14: flags).